Fans will be automatically entered by purchasing a football season ticket or individual football game ticket on-line. Liberty University welcomes Head Coach Hugh Freeze to the sidelines. 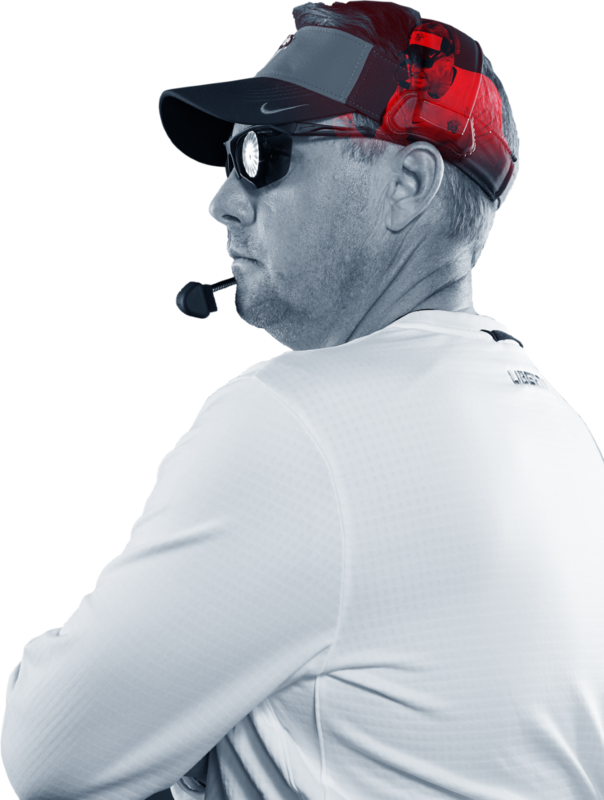 Known for his high-powered and explosive offense, the former Ole Miss head coach has provided an immediate influx of enthusiasm within the Flames Nation, and fans everywhere are excited to have Coach Freeze leading the program. Last season, the Flames finished 6-6 in their first season of FBS football – college football's highest level of competition – making them just the ninth team to win six or more games in an inaugural FBS campaign. 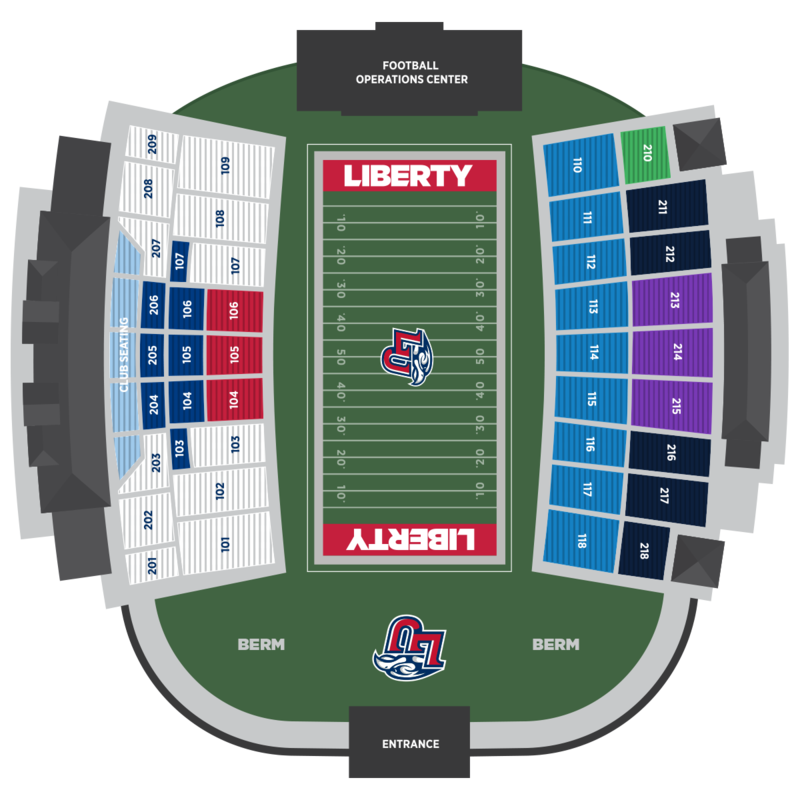 The 2019 season kicks off August 31 when Liberty opens at home against ACC opponent Syracuse – the first Power 5 and nationally ranked FBS team (preseason No. 15) to visit Lynchburg. The whole family can have fun at the Flames Fan Fest inside the Liberty University Indoor Practice Facility. Everyone can enjoy the tailgate, cookout, and games, and kids can be entertained by the inflatables and balloon animals. And they might see Sparky and the cheerleaders. It’s also a great place for alumni to meet and reconnect. After the Flames Fan Fest, head to Williams Stadium for a pregame performance by the Spirit of the Mountain Marching Band and fireworks. Then, make sure you’re in your seats during the fourth quarter for the T-shirt cannon. Williams Stadium was recently renovated to enhance fans’ game day experience. Now with an upgraded WiFi network, new seating and restrooms, and additional concession stands, Williams is even more comfortable. The new video board is four times bigger than the previous one, allowing fans to watch replays, catch up on scores from other games, and see themselves on the big screen. Reserve Your Seats Now For All Six Home Games & Save Big! Includes luxury seating and access to the Club Pavilion with private restrooms, TVs, food, and beverages available throughout each game. Available to Flames Club members at the Director's Level ($3,000) and above. Bleacher Seats on the sidelines. Chairback seats located between the 30-yard lines. Available to Flames Club members at the Flames Level ($300) and above. Benchback seats located between the 30-yard lines. Benchback seats located between the 30-yard lines. Available to Flames Club members at all levels. *Seats are assigned by Flames Club membership level and loyalty points total and are based on availability. The Flames Club is directly linked to the success of Liberty University Athletics and is the channel through which Flames Nation — fans, ticket buyers, students, alumni, former student-athletes, parents, families, and local businesses — can participate in the success of the athletics program. Members of the Flames Club enjoy the satisfaction of knowing that their gifts are more than monetary contributions — they are investments in the lives of our student-athletes. Flames Club members can also be rewarded with preferred parking, seating, and hospitality privileges, based upon membership level. Free general parking is available in the LaHaye, Doc's, DeMoss, and Furnace Lots as well as in the Academic Commons Parking Garage. Lots closer to Williams Stadium are reserved for Flames Club members, with preferred parking privileges beginning at the Eagle Level ($120). 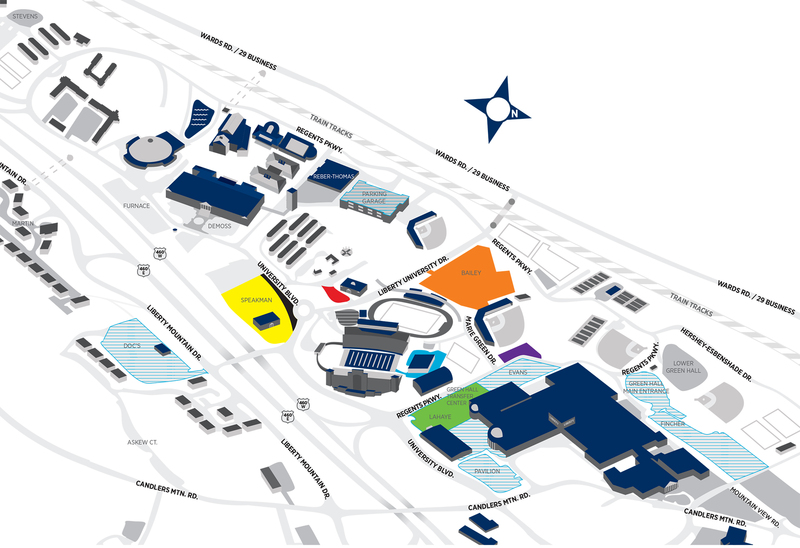 Contact the Flames Club for all questions regarding preferred parking. Game day tailgating is permitted and encouraged throughout campus. Flames Club members at the Coaches Level ($600) and higher are eligible to request special passes for reserved tailgating. yellow@2x Created with Sketch. red@2x Created with Sketch. blue@2x Created with Sketch. purple@2x Created with Sketch. grey striped@2x Created with Sketch. orange@2x Created with Sketch. Telephone Please enter a valid phone number. We appreciate your support of Liberty Football. A member of our staff will be in touch with you soon. NO PURCHASE OR PAYMENT OF ANY KIND IS NECESSARY TO ENTER OR WIN. A PURCHASE WILL NOT INCREASE YOUR CHANCE OF WINNING. THE SWEEPSTAKES BEGIN AT 10:00 A.M. EASTERN DAYLIGHT TIME (“EDT”) ON SEPTEMBER 9, 2017 AND END AT 3:30 P.M. EDT ON NOVEMBER 4, 2017 (THE “SWEEPSTAKES PERIOD”). SWEEPSTAKES ARE ONLY OPEN TO LEGAL RESIDENTS OF THE UNITED STATES RESIDING IN THE 50 UNITED STATES AND THE DISTRICT OF COLUMBIA WHO ARE 18 YEARS OF AGE OR OLDER AT THE TIME OF ENTRY. Fans purchasing a football season ticket will be entered automatically, and will receive one entry for each of the first five home football game drawings. Fans purchasing an individual football game ticket online will receive one entry for the attendant drawing at that home football game. Fans purchasing an individual football game ticket at the Williams Stadium Box Office before kickoff on the day of the game will have the opportunity to complete one entry for the attendant drawing at that home football game by following the directions they receive with their ticket or by sending a text to register online when prompted during the game. Fans may complete a no-purchase-necessary entry form on the day of each of the first five home football games. Entry forms will be located at the Liberty Book Store located at 1971 University Boulevard, Building #65, Lynchburg, Virginia 24502, and available on game days prior to the start of that day’s game. Fans will receive one entry to that day’s home football game drawing. The first five Liberty home football games are scheduled for: September 9th, September 16th, September 30th, October 14th and November 4th. Any attempt to submit more than the maximum number of entries using multiple/different email addresses, identities, social media accounts or any other methods may void that entrant’s entry. Entries generated by a robotic, programmed, script, macro or other automated means will be disqualified. Entries must not contain inappropriate material as determined by Sponsor, in its sole discretion. No other forms of entry are valid other than those set forth above. Entries not selected as a semifinalist will not “rollover” or be eligible for the drawings at subsequent home football games. All entry information becomes the property of Sponsor. One (1) Grand Prize. The Grand Prize is a trip for winner and one (1) guest to attend the 2018 College Football Playoff National Championship game scheduled to take place in Atlanta, GA on January 8, 2018 (the “Championship Game”). The Grand Prize consists of two (2) round-trip coach airline tickets provided for the winner and his/her guest, one (1) double-occupancy standard hotel room accommodations for winner and one (1) guest for two (2) nights, two (2) tickets to the Championship Game, a 3-day car rental, and $300 spending money (awarded in the form of a check payable to the winner). Seating assignments at the Championship Game are at Sponsor’s sole discretion. Winner and guest must travel on the same flight itinerary and comply with all security requirements. Winner and guest must have all necessary identification and/or travel documents (e.g. a valid U.S. driver’s license) required for travel within the United States, within seven (7) days of travel. Any guest that is a legal minor on the trip must be accompanied by the minor’s parent or legal guardian who must be the winner. Travel dates: January 6, 2018 – January 9, 2018. Winner and guest must travel on dates specified herein; no alternate travel dates available. Winner or guest must have a valid driver’s license and insurance for rental car. Selection of airport, airline, hotel, rental car, and travel dates are at Sponsor’s sole discretion. Sponsor assumes no responsibility for cancelled, delayed, suspended or rescheduled events (including airline flights, rental car, and the game) beyond its control. All other expenses not specifically stated herein are solely the responsibility of winner and guest. All travel and accommodations are subject to availability, change and restrictions. Winner may not sell, assign, gift, or otherwise transfer the Grand Prize to a third-party without the prior written consent of Sponsor, which consent may be withheld, denied or conditioned at the sole discretion of Sponsor. Any such sale, assignment, gift or transfer without the prior written consent of Sponsor shall be void. Approximate retail value of Grand Prize is $3,000. Five (5) Semifinalists. There will be five (5) semifinalists chosen, one during each of the following Liberty Football home games on September 9th, September 16th, September 30th, October 14th, and November 4th, 2017. Each of the five (5) semifinalists will win four (4) tickets to the final Liberty Football home game on November 11, 2017 and a gift bag of Liberty merchandise and promotional items. Approximate retail value of each semifinalist gift bag is less than $600. ODDS OF WINNING. The odds of winning and becoming a semifinalist are dependent on the number of entries received for each Liberty Football home game. The odds of winning the Grand Prize among the semifinalists are 1 in 5. DRAWINGS. One semifinalist will be selected by random drawing and announced at each of the first five Liberty Football home games. Entrants do not need to be present to be selected as a semifinalist. Each of the selected semifinalists will be invited and provided tickets to attend the final Liberty Football home game of the season on November 11th. The Grand Prize winner will be selected at random from among the five semifinalists and announced during the November 11th game. Semifinalists do not need to be present to win the Grand Prize. ELIGIBILITY. Sweepstakes open only to legal residents of the United States residing in the 50 United States and the District of Columbia who are 18 years of age or older as of the date of entry. Employees, officers, directors, and trustees of Liberty University and the National Collegiate Athletic Association, their respective subsidiaries and affiliates (and their respective IRS dependents and immediate family members [parents, children, siblings and spouse]) are not eligible to participate or win. Semifinalists may be required to complete a Certificate of Eligibility. SPONSOR. The Sponsor of these Sweepstakes is Liberty University, Inc., 1971 University Boulevard, Lynchburg, Virginia 24515. These Sweepstakes are in no way sponsored, endorsed or administered by, or associated with the National Collegiate Athletic Association (NCAA) or the 2018 College Football Playoff National Championship. Any questions, comments or complaints regarding these Sweepstakes should be directed to Liberty University Marketing at 1971 University Drive – Williams Stadium (2nd Floor), Lynchburg, VA 24515. GENERAL TERMS. Void wherever prohibited or restricted by law. Winners are not required to accept any prize. If not accepted, prize will be forfeited or awarded to another entrant in the sole discretion of Sponsor. No substitution of prize is permitted. Non-cash portions of a prize may not be redeemed for cash value (except at the sole discretion of Sponsor). Prize winners will be solely responsible for all applicable federal, state and local taxes on prize. Grand Prize winner will receive an IRS Form 1099 for the value of the Grand Prize. All other expenses in connection with the receipt and use of a prize not specifically mentioned herein are solely the responsibility of the winners. Any portion of a prize not accepted by winners will be forfeited. These Official Rules shall be administered and interpreted in the sole determination of the Sponsor, whose administration and interpretation thereof shall be final. Each winner’s first name, last initial, hometown and state will be disclosed on a Winner’s List which will be distributed upon request and as required by law. All entrants, as a condition of entry, agree to be bound by these Official Rules and the decisions of Sponsor. CONDITIONS. All entrants, as a condition of entry into the Sweepstakes, agree to release Sponsor, its subsidiaries and affiliates, and their respective trustees, directors, officers and employees from and against any and all liability, claims or actions of any kind whatsoever for injuries, damages, or losses of any kind to persons including death or property which may be sustained directly or indirectly in connection with the receipt, ownership, use or misuse of any prize awarded, or while preparing for, participating in or traveling to or from any prize-related activity or for any typographical or other error in these Official Rules or the announcement or offering of any prize. Except where prohibited by law, winners grant to Sponsor and its subsidiaries and affiliates the right to print, publish, broadcast and use worldwide in any medium and media now known or hereinafter known his/her name, address, biographical information, voice, statement, picture and/or other likeness, without additional review, notification or compensation, for public relations, advertising and promotional purposes as may be determined by Sponsor. LIMITATIONS OF LIABILITY. Sponsor assumes no responsibility for (a) lost, illegible, late, misdirected, or incomplete, entries; or other errors of any kind whether human, mechanical, electronic or network or the incorrect or inaccurate capture of entry or other information or the failure to capture, or loss of, any such information (b) any incorrect or inaccurate information, and (c) any other unforeseeable events. Sponsor reserves the right, at its sole discretion, to disqualify any individual it deems to be tampering with the entry process or operation of the Sweepstakes, or to be acting in an unfair or disruptive manner, or with intent to threaten, abuse or harass any other person. Sponsor is not responsible for injury to entrants resulting from participating in the Sweepstakes. If, for any reason, Sweepstakes, in the sole opinion of Sponsor, is not capable of running as planned by reason of tampering, unauthorized intervention, fraud, technical failures or any other causes which, in sole opinion of Sponsor, corrupt or affect the administration, security, fairness, integrity or proper conduct of the Sweepstakes, Sponsor reserves the right, at its sole discretion, to cancel, terminate, modify or suspend the Sweepstakes, and randomly determine winners from all eligible, non-suspect entries received prior to the action taken, or as otherwise deemed fair and equitable by Sponsor. ANY ATTEMPT BY AN ENTRANT OR ANY OTHER INDIVIDUAL TO DELIBERATELY DAMAGE OR UNDERMINE THE LEGITIMATE OPERATION OF THE SWEEPSTAKES COULD BE A VIOLATION OF CRIMINAL AND CIVIL LAWS AND SHOULD SUCH AN ATTEMPT BE MADE, SPONSOR RESERVES THE RIGHT TO SEEK DAMAGES FROM ANY SUCH PERSON TO THE FULLEST EXTENT PERMITTED BY LAW. GOVERNING LAW AND JURISDICTION. These Official Rules and the Sweepstakes are governed by, and any dispute arising thereunder shall be determined in accordance with, the laws of the Commonwealth of Virginia, without giving effect to the conflict of laws rules thereof. Any matters or proceedings which arise therefrom shall be resolved through litigation in a state or federal court sitting in Lynchburg, Virginia. WINNERS’ NAMES. For the first name, last initial, hometown and state of the winners, mail in a self-addressed, first class-stamped envelope to: Liberty Athletics Marketing, 1971 University Dr. – Williams Stadium (2nd Floor), Lynchburg, VA 24515, by December 30, 2017.